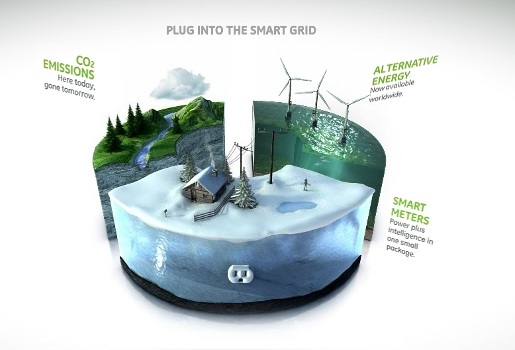 GE’s Plug Into the Smart Grid campaign has been recognised in the 2010 D&AD Awards, included in the D&AD Book in the Web Sites category for animation. Launched in February 2009 the site, PlugintotheSmartGrid.com, features an augmented reality component providing insights into the company’s use of wind and solar power. The site explains how the Smart Grid works in and out of consumers’ homes, as well as it’s impact on environmental issues, like carbon dioxide emissions and alternative energy usage. With the augmented reality function, users can manipulate 3D models of wind and solar power using only a webcam and a solar panel marker, a distinct symbol that will activate the hologram, found on GE print ads, printed off the microsite or Facebook page or pulled up on an iPhone screen. The Smart Grid campaign was developed at Goodby, Silverstein & Partners by creative director Jeff Goodby, group creative director Christian Haas and Rudi Anggono, art director Caio Lazzuri, copywriter Larry Corwin, chief digital officer Mike Geiger, agency executive producer Carey Head, agency interactive producer Stella Wong. Web production was done at North Kingdom, Stockholm, by executive producer Roger Stighäll, producer Sonja Lakner, 3D artist Mathias Lindgren, Flash partner/sound designer Gomo AB, Flash designer Mikael Emtinger and Stefan Sandberg, sound designer Christian Björklund. Filming was produced at AutoFuss, San Francisco, by director Jeff Linnell, producer Julia Scahill, director of photography Devin Whetstone and editor Jess Bianchi.